I haven’t posted progress photos since demo day, so unless you follow me on Snapchat (msinthemidwest), then this is your first look at our new cabinets! What a difference, right?! I occasionally still have to remind myself where we started – it’s hard to even imagine those bulky 90s-style oak cabinets in the space. If any of you have lived through a major home renovation, then you know and can understand the frustration when things don’t go according to plan or the timeline. I’ve had to continually remind myself of that fact throughout the past few weeks. See, we could be a lot further, but one of the cabinets arrived damaged and had to be replaced. 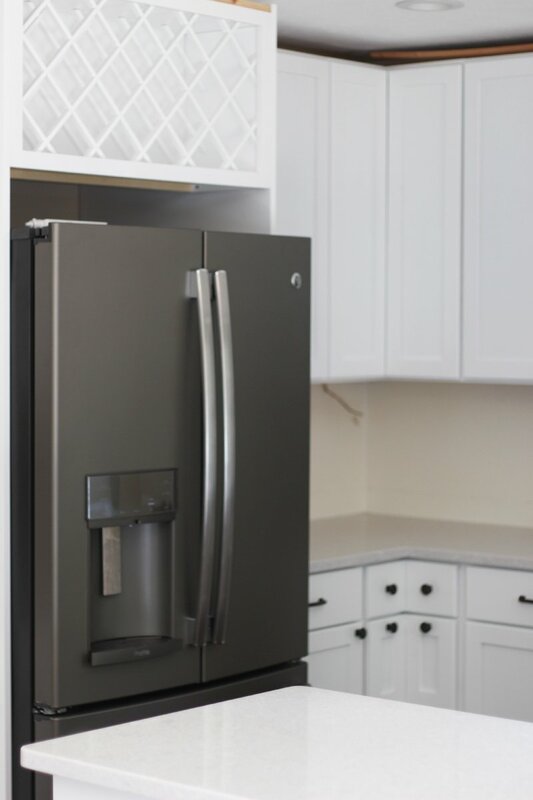 And, it wasn’t just any cabinet – it had to be the corner cabinet on the other side of the fridge, which meant that none of the crown molding, under-cabinet lighting, etc., could go up or be installed until the new cabinet arrived. That process ultimately took another four weeks, and the cabinet finally went in last week. On the bright side, the space is at last usable! The appliances are up and running, our beautiful quartz counter tops were installed last week, and we finally have running water. While we’re still eating off paper plates and using plastic utensils – we were told not to put all our stuff away in the cabinets quite yet – it’s basically a luxury to eat in our own home again. Granted, we’ve only made bread sticks and a frozen pizza, but hey – it beats take out. The last “big” part that we’re still waiting on is the installation of our back splash. We were hoping that that was going to occur this week, but again, nothing ever seems to go according to plan with these projects. So, we’re currently on the schedule for next week, and I’m going to cheer when the last person walks out of the house and I don’t have to revolve my schedule around workers anymore! Otherwise, our contractor is back from vacation this week and will get back to work on all the details – crown molding, toe kicks, touch up paint, etc. I have drafted quite the list for him, so I’m sure he will be just thrilled with me. 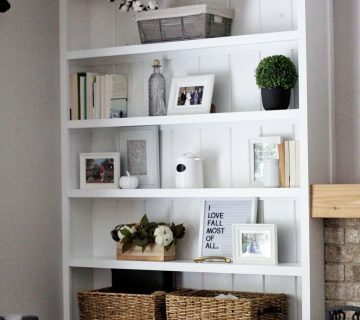 I’m definitely not going to apologize for that, though – the details are what finish a space and make it feel complete. Thanks for hanging in there with me through all of this – I cannot wait for the final reveal! 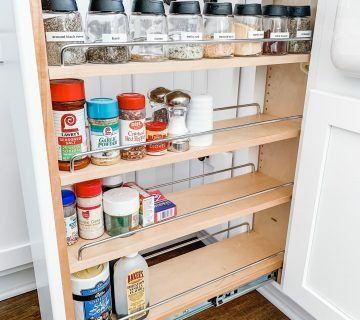 Have you lived through a kitchen renovation? Any tips on how to survive the final few weeks? It looks so much cleaner and bigger! We have those bulky oak cabinets too and were considering just painting them, but after seeing this I think I want a fresh start! oh my gosh! it looks amazing. i can’t imagine how frustrating it is to live through something like this, but yay for being at the home stretch now! we’ve never done a big home renovation, we did the floors but that didn’t really disrupt our lives too much. i love that sink! It’s looking soooo so good! 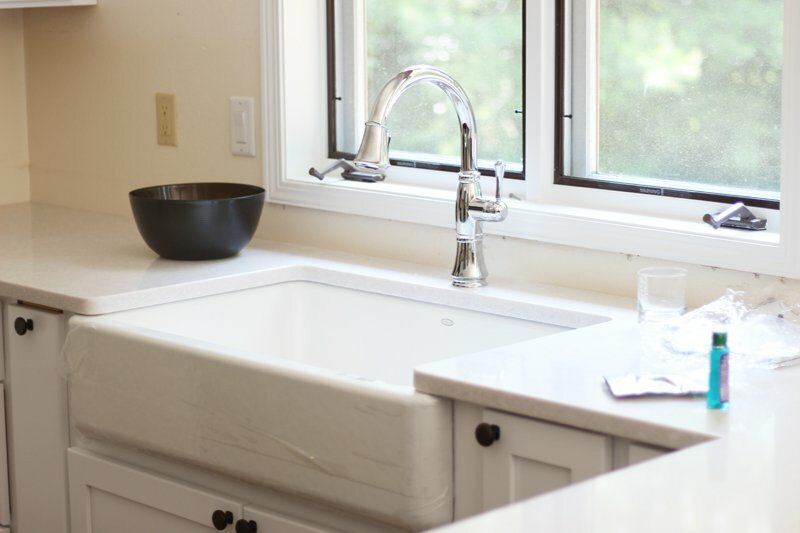 Drooling over your farmhouse sink – totally worth the splurge! Living in a construction zone has gotta be tough- I’d be going nuts! You’re taking it all in stride. 🙂 And the kitchen is looking amazing- can’t wait to see more! I’ve had my moments (lol), but I’m trying to stay as upbeat as I can! Thanks, lady! It is looking SO great – so bright and fresh!! My Dad renovated our kitchen at the cottage himself, he started in August I think and planned to have it finished in the fall, but didn’t get back home until Christmas Eve! Things never go exactly according to plan! Hang in there, you know it will be 100% worth it when you can move all your stuff back in and enjoy your dream kitchen! You’re so right, all worth it for my dream kitchen! Thanks, girl! Our kitchen reno was the biggest part of the entire renovation I feel like, whew! I’m definitely thinking about ya but also, how exciting? Can’t wait to see! Everything is looking amazing!! I love how bright it feels. I know what you mean about timelines and the kitchen would be especially tough to have under construction that long. You’ve got this! Thank you so much! It definitely is a much brighter space now! Your kitchen looks so beautiful! 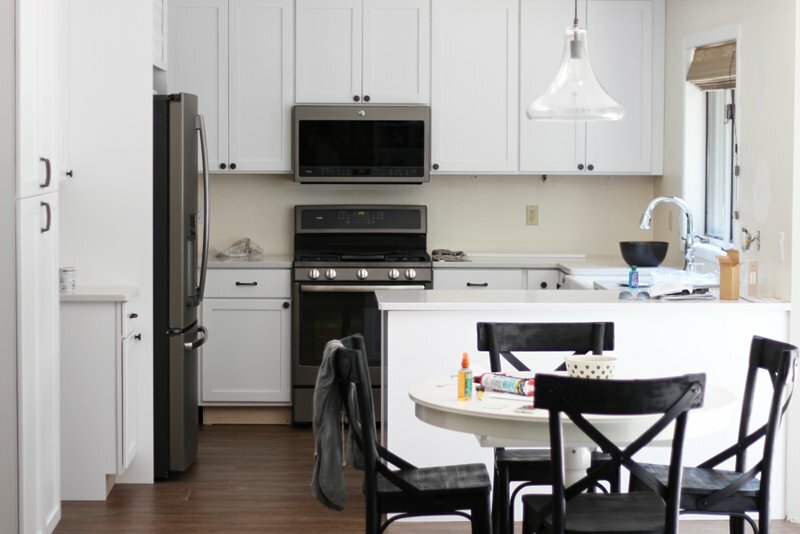 The countertops and the cabinets go together perfectly, and everything looks so much brighter now! I can’t even imagine how much of a pain a big reno like that is, but it looks like everything was completely worth it! It has been worth it so far – I’ll be happy when people don’t have to come to the house for a while! 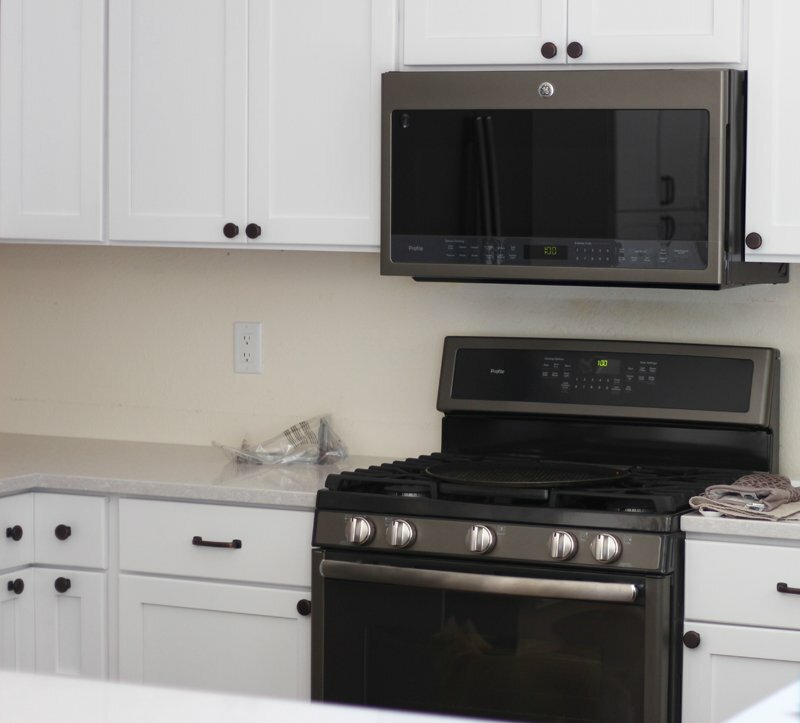 (Workers, that is) and, I can’t take credit for the countertops – Ryan picked them out! Everything is looking amazing so far, I love how clean and crisp everything looks! Hang in there, and yay for it at least being usable! Yes, definite bonus that I at least can use stuff in there now! I want your kitchen. I love all the white, and can’t wait to see it with the backsplash added. It so classy and beautiful! Thank you! I definitely took the white out approach, lol. GORGEOUS! I cannot wait to see the end product. It is such a huge difference and looks so, so lovely! Thank you! It’s crazy to look back at where we started! Y’alls kitchen looks SO good and the backsplash is going to tie everything in together perfectly! I’m so anxious for the backsplash! Thanks, friend! It is gorgeous!! 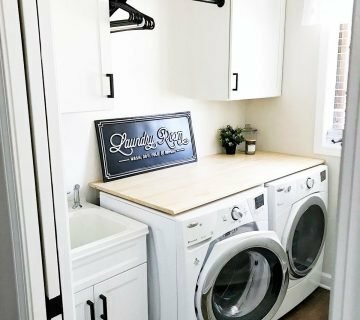 Obsessed with your sink (on my wish list for our next house) and the color combos are beautiful – You’ve done a great job! I never thought I’d see the day where I am insanely jealous of a gorgeous farm sink! It is coming together beautifully! You’re so sweet, thanks girl! That sink is my dream. Everything has come together so well and it looks amazing!! Thank you! Definitely a bit of a process but we are almost there hopefully. Thank you! That’s one of my favorite features, too! Your kitchen is looking so good so far! Can’t wait to see the finished product! The kitchen looks amazing, can’t believe the total transformation! Love, love it all!! I know it’s been a process and things didn’t always go as planned, but totally worth it! Enjoy! We are in the homestretch now hopefully, can’t wait for you to see it in person! Your kitchen looks great! Definitely worth the hard work and patience! Can’t wait to see the backsplash!